By Jonathan Cook – from Nazareth, Israel: Here’s a small thought experiment that even the editor of the Guardian, Kath Viner, should be able to manage. Who do you help when you censor a cartoon depicting Israel’s well-documented war crimes against Palestinians – and do so on the grounds that the criticism of Israel is anti-semitic? The answer is: you help anti-semites. Here is the cartoon the Guardan does not want its readers to see. It was drawn by Steve Bell, probably Britain’s foremost political cartoonist. It shows Israeli prime minister Benjamin Netanyahu seated alongside his British counterpart, Theresa May, in Downing Street. Their cosy alliance is shown being promoted to the cameras at a terrible price to the Palestinians. The diminutive figure of Razan al-Najjar, a young Palestinian medic who was murdered last week in Gaza by an Israeli sniper as she came to the aid of other Palestinians being killed and wounded by other Israeli snipers, serves as a symbol. Burning in the Downing Street hearth between Netanyahu and May, she is the sacrificial victim fuelling their power relationship. So what, we might ask, could possibly be anti-semitic about the cartoon? Does it make a generalisation about Jews? No. Does it even make a generalisation about Israelis? No. It deals only with the hawkish leader of Israel. But in fact, one could argue that it is not even chiefly about Israel or Netanyahu. It is probably best read as an indictment of the way leaders like May cosy up to Israel as though Palestinian lives are so inconsequential that they do not need to be taken into account. The cartoon indicts the immoral calculations made in the pursuit of political power, the terrible price paid by the victims, and our – the viewer’s – collusion in a system that privileges the powerful and ignores the powerless. In other words, it represents all that is best about political cartoons, or what might be termed graphic journalism. It holds power – and us – to account. And yet the Guardian has decided its readers need shielding from this message. It has preferred to side with the powerful against the powerless, and to prioritise the sensitivities of a nuclear-armed state over the suffering of a stateless people held captive by their occupier. But as bad as that is, the Guardian has done something even worse. It has justified this awful act of censorship by accusing the cartoonist of anti-semitism. 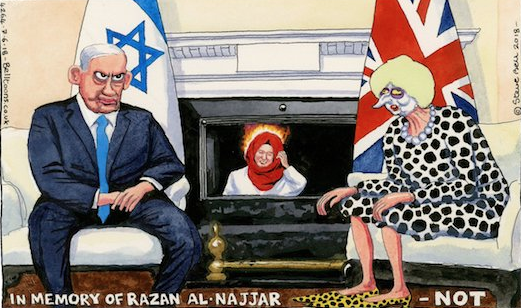 From the correspondence we have seen from Bell, it seems that Viner and other editors believed presenting Razan al-Najjar as a burning piece of human coal might suggest parallels with the Nazis, crematoria and the Holocaust. We might ponder what this reveals about the limits of the cartoonists’ art when it comes to depicting Israel, a highly militarised state currently celebrating the 51st year of its belligerent occupation of the Palestinian territories. A state that is currently committing regular massacres of non-armed Palestinian demonstrators trying to liberate themselves from the prison of Gaza. Showing Palestinians as sacrificial victims, according to the Guardian, is anti-semitic. And, as another major British cartoonist, Gerald Scarfe, discovered a few years ago, presenting the daily reality of Palestinians bleeding under occupation is, according to the Sunday Times, a blood libel. Meanwhile, the German newspaper Süddeutsche Zeitung just recently sacked its cartoonist for anti-semitism after he depicted Netanyahu holding a missile as he celebrated the chance to exploit Israel’s victory at the Eurovision song contest. In a post last month, I described this process as the mystification of anti-semitism. I explained why it is so dangerous and how it is being abused to shut down all sorts of political conversations we desperately need to have – and not just about Israel. But here I want to make an additional point. Does Viner’s act of censorship actually help to realise what she and the other editors claim they want to achieve? Does it contribute to lessening the threat of anti-semitism? The answer is that it does not. In fact, quite the reverse: it can only serve to fuel anti-semitism. When harsh critiques of Israel and its leaders are silenced – and harsh critiques of Israel are precisely what we need – Israel is being treated as a special case. It is benefiting from a kind of reverse anti-semitism, or philo-semitism. In those circumstances, the logic of the real anti-semite starts to sound more plausible. He says that “the Jews” secretly control the world, their tentacles everywhere. No one, not even the most powerful countries on earth, can stand up to them. Which is why “the Jews” can get a cartoon of Netanyahu censored, why “the Jews” can intimidate the biggest newspapers and TV stations, why “the Jews” have our politicians in their pockets. When we fail to hold Israel to account; when we concede to Israel, a nuclear-armed garrison state, the sensitivities of a Holocaust victim; when we so mistake moral priorities that we elevate the rights of a state over the rights of the Palestinians it victimises, we not only fuel the prejudices of the anti-semite but we make his arguments appealing to others. We do not help to stamp out anti-semitism, we encourage it to spread. That is why Viner and the Guardian have transgressed not just against Bell, and against the art of political cartoons, and against justice for the Palestinians, but also against Jews and their long-term safety.